December 6, Cayuga County, NY – The 2016 Finger Lakes Sweet Treat Trail ended their season on November 16, 2016 and selected three Sweet Treat travelers to win holiday baskets full of sweet treat goodies from trail partners. 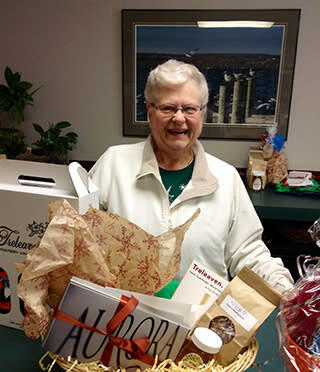 To win the baskets, participants travelled the Finger Lakes Sweet Treat Trail between May 1 and November 15 and had their tasting tour pass stamped at a minimum of eight different stops for a chance to win one of three holiday baskets filled with items such as wine, honey, granola and gift cards from the 20 sweet treat trail stops. Pictured to the right is one of this year’s winners, Janis Nower, from King Ferry. This popular trail created by the Cayuga County Office of Tourism promotes locally grown and produced sweet treats and was voted one of the Best Food Trails by Readers of USA TODAY and 10Best. The 2016 trail included twenty stops to enjoy locally grown and made sweet delights ranging from fruit wines to maple syrup to jams and jellies.